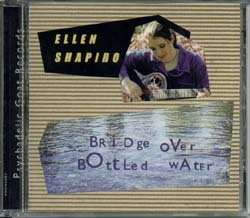 In 1999, I put out a little album using a 4 track tape recorder and what was, to that point, my life savings: Bridge Over Bottled Water. Listen To (Or Even Buy) The Album! If you prefer to stream your music or would like to Try Before You Buy, you can hit up Spotify or Rdio. If you enjoy paying cash money for music you enjoy, your two easiest ways to grab a copy is via either via the iTunes Music store and at the Amazon MP3 Store for less than ten bucks.